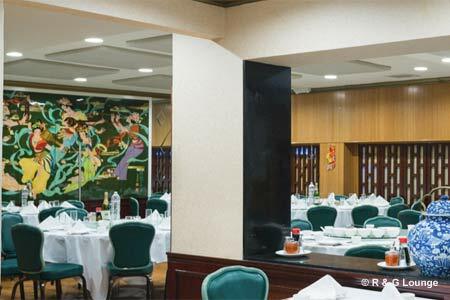 An elegant Chinatown favorite for mostly Cantonese dishes, including popular salt-and-pepper seafood items. : R & G has a dual personality. Downstairs at basement level is a family-style restaurant. Upstairs at street level is an elegant dining room. A diverse but seafood-forward menu includes exotica such as fish-maw soup, duck tongue, geoduck sashimi, salmon-avocado egg rolls and Chinese-melon clay pot, with one section devoted entirely to lower-calorie dishes. A good choice is crisp salt-and-pepper shrimp. Private rooms are popular for banquets.